Protesters gather at 13th and Market streets around noon on Thursday, Jan. 26, not long before President Donald Trump was expected to arrive at the Loews Philadelphia Hotel, 1200 Market St., for the Republican House Senate Leadership Conference. 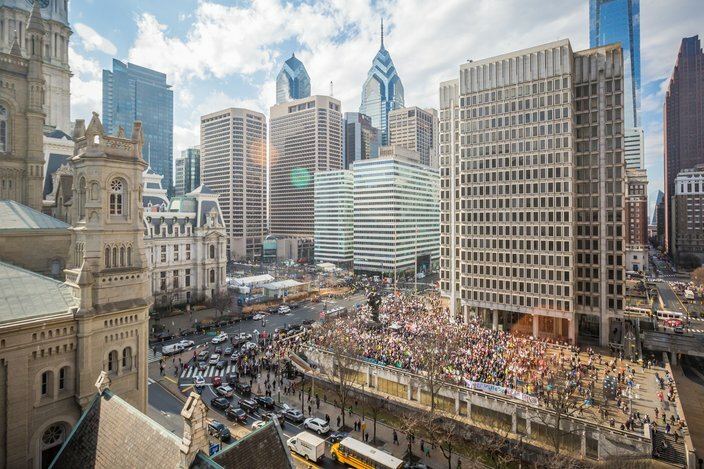 Hundreds of protesters marched through Philadelphia on Thursday, moving from Thomas Paine Plaza to an intersection near the Center City hotel where President Donald Trump and Republicans were holding a retreat. 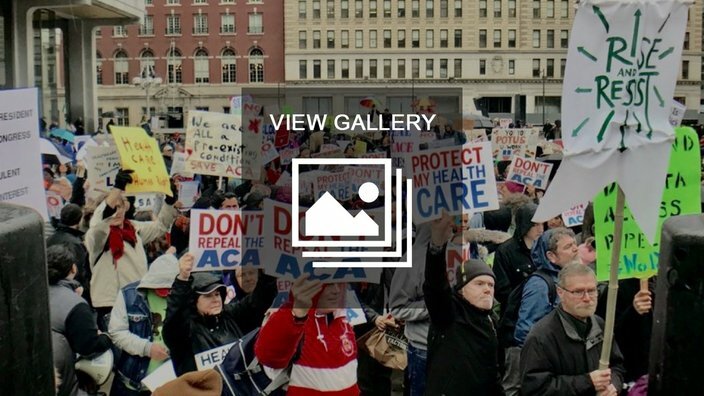 Many of the demonstrators came out to protest Trump and the GOP's efforts to repeal the Affordable Care Act, the health care plan enacted under former President Barack Obama. Trump was joining congressional Republicans at an annual retreat being held at the Loews Hotel, located at 1200 Market St. Air Force One landed in Philly just after 12:15 p.m., and Trump began his address about an hour later. His speech focused on many of the same issues as his campaign last year – building a wall on the Mexican border; repealing and replacing Obamacare, renegotiating trade deals and increasing jobs. He also spoke about "sanctuary cities," of which Philadelphia is one. Sanctuary cities have policies preventing local law enforcement from coordinating with federal immigration authorities unless they have an arrest warrant for a person. Trump signed an executive order on Wednesday aimed at eliminating federal grant funds for sanctuary cities. The president said with the order the U.S. government was "at long last cracking down on sanctuary cities. ... It's time to restore the civil rights of Americans, to protect their jobs, their hopes and dreams for a much better future." He also spoke about violent crime in the country's large cities, including Philadelphia, where he said the murder rate is "steady, I mean, just terribly increasing," before switching his focus to Chicago's violent crime problem. That characterization before a global audience drew quick response from Philadelphia Mayor Jim Kenney, who labeled it a "false claim." "President Trump’s false statements today were an insult to the men and women of the Philadelphia police force — the very same men and women who are working long hours today to ensure his safety," the mayor said in a statement. "Our police officers have worked tirelessly and with great personal sacrifice to get Philadelphia’s crime rate down to its lowest point in forty years, while also successfully implementing reforms to strengthen police-community relations and uphold the rights of all our residents. Our homicides are, in fact, slowly declining, and while we are not satisfied with even our current numbers, we are handicapped by Republican refusal to enact any kind of common sense gun control and by their obsession with turning our police officers into ICE agents - which will prevent immigrants from coming forward to report crimes or provide critical witnesses statements that can put dangerous criminals behind bars." Republicans are discussing health care at their meeting amid efforts to dismantle the Affordable Care Act, one of Trump's major campaign promises. Hundreds of protesters gathered at Thomas Paine Plaza, across from City Hall, for a late-morning rally. 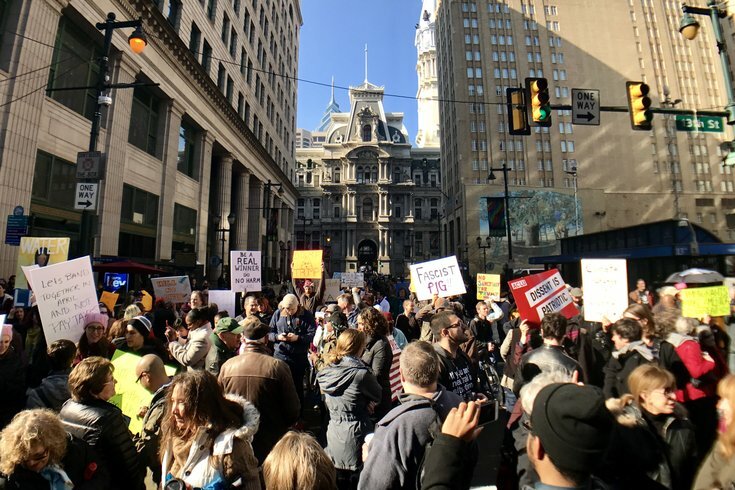 Shortly after noon, they began marching around City Hall, heading to 13th and Market streets, the closest point they could get to the hotel were Trump and Republicans were meeting. "We're trying to bring awareness to how important health care is," said Salewa Ogunmefun, political director from the advocacy group One Pennsylvania. "It's not politics. It's about survival for the people here in Philadelphia." Organizers called the protest an opportunity to show that they will not stand silent while the new Republican organization works to repeal the ACA. Instead the group is demanding reforms of Obama's health care plan. "It's not a bash Donald Trump event," Ogunmefun said. "It's really about making sure that everybody understands that we don't want the Affordable Care Act repealed. "It should be improved." The huge demonstration, more than a thousand strong on the plaza outside the Municipal Services Building, was energetic but peaceful as protesters listened to speakers. Most protesters then marched en masse to 13th and Market streets, where they held signs and chanted as they awaited Trump to arrive at the hotel. "He's orange, he's gross," protesters chanted. "He lost the popular vote." "Philly hates Trump," others chanted. Protesters gather at Thomas Paine Plaza in Center City early Thursday afternoon before marching down East Market Street to the Loews Hotel, where President Donald Trump was meeting with congressional Republicans. Among the myriad signs: "This sign was gagged," Obama's crowd was bigger" and "Climate change is real." Others decried the Dakota Access Pipeline or called for saving the ACA. After Trump began his speech, the crowd thinned somewhat at 13th and Market, with at least one contingent saying they planned to march to 8 Penn Center on JFK Boulevard, the Philadelphia office of U.S. Senator Pat Toomey. One protester from Philadelphia, Tyheera Sanders, 32, said the ACA keeps her medications affordable. Sanders has Antiphospholipid Syndrome, a blood clotting disorder, and cardiomyopathy, a disease of the heart muscle, which require her to take two pills and three shots daily. The medications cost about $1,300 per month, said Sanders, a member of Service Employees International Union Local 668. "I would love for the ACA to stay the way it is," she said. "Without Obamacare, I don't know where I would be." If the GOP indeed repeals the ACA, Sanders says she wants them to unveil an alternative plan ahead of time. "You have rich people in Congress, that have money, that are making the choices that we should be making for ourselves," Sanders said. Protesters also called on the GOP to avoid massive Medicaid cuts and reject Medicare vouchers. On Wednesday, the Republican congressional delegation commenced a three-day retreat in Philly to determine its policy goals and strategies during the next session. Trump, Vice President Mike Pence, British Prime Minister Theresa May and former NFL star Peyton Manning were all reportedly slated to address the GOP on Thursday. The U.S. Secret Service has ordered a secure perimeter to limit pedestrian access to streets bordering the Loews Hotel, effective at 6 a.m. Thursday. Access to the 1100 and 1200 blocks of Market Street, as well as nearby portions of 12th and 13th streets, is restricted. While health care remained the main focus of the protest, some voiced their concerns on other issues. Holly Sharpe, 47, of Wyndmoor, Montgomery County, said she is fearful that Trump will attempt to suppress voters, discredit journalists and deregulate Wall Street. She views Trump's presidency as "a threat to democracy." "We've gained so much in the eight years Obama was in office," she said. "Now, it's all going to be for naught." Sharpe traveled to participate in the Women's March on Washington last weekend. She also makes regular calls to her senators. "I truly hope this will become a movement and not a moment," Sharpe said. "This needs to be a movement for anything to happen." Patrick Manning, 34, of South Philadelphia, came out to protest the executive orders Trump signed to build a wall on the United States' southern border and to penalize so-called sanctuary cities. "I'm just very angry about these new immigration policies and refugee policies that Trump just signed," Manning said. "I feel very thankful that Mayor (Jim) Kenney is standing up to them." 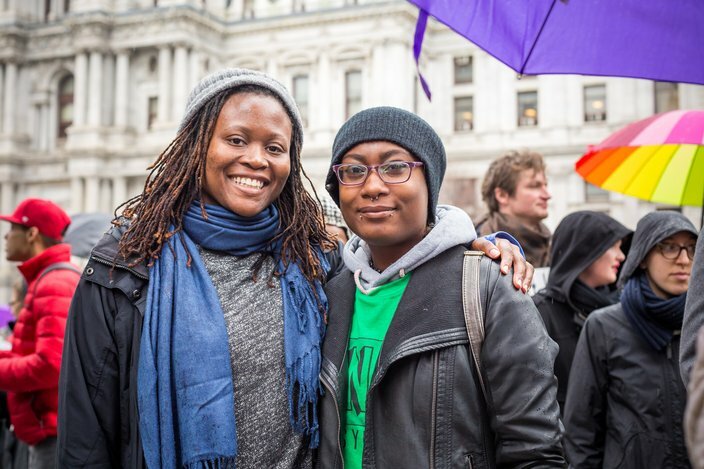 Salewa Ogunmefun, political director for One Pennsylvania, left, and Khiah Warren, member of One Pennsylvania, gathered at Thomas Paine Plaza in Center City, Thursday, Jan. 26, 2017. The demonstrations were just the latest in a series of protests held in Philadelphia since Trump was sworn into office last Friday. An estimated 50,000 demonstrators participated in the Women's March on Philadelphia on Saturday, joining nearly 3 million others around the world in protesting the new administration. One day earlier, dozens of Philadelphians had marched through the rain in the hours after Trump took office. Mayor Jim Kenney has urged protesters to remain peaceful. He told WHYY that the violence witnessed in Washington on Inauguration Day "solidifies people's negative opinions about the folks who are protesting." The demonstrations, coupled with road closures on Market Street and around the city as dignitaries come and go, were expected to create a logjam of traffic in Philadelphia throughout the day. Police closed Market Street from Juniper to 11th streets at 8 a.m. Thursday. Also closed was 13th Street, from Chestnut to Market streets, and 12th Street, from Chestnut to Arch streets. The closures are expected until 6 p.m. Thursday. Trump's appearance also prompted SEPTA to close the 13th Street Station on the Market-Frankford Line. Trains are bypassing the station, but will continue to stop at 11th and 15th Street stations.